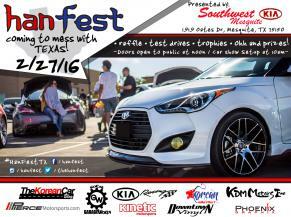 HanFest is back for another car show and this time the great state of Texas! Trophies, Free food, music and giveaways! Plus the Kia Racing team will have two of their race cars on-site to check out! Car show registration link: HanFest 2016 - Dallas/Fort Worth, Texas! Car show Registration Deadline: Feb. 17th. Spectators are free but must register for a ticket (same link as above). For more info visit the HanFest Facebook page.